All you need to add is a wind source, basic tools, and imagination! Perform all of the same investigations as the Basic Wind Experiment Kit with the ability to generate more power at higher voltages (0.5 V–20 V). Discover advanced concepts of wind turbine technology, including gearboxes and generator construction (with the GenPack add-on). 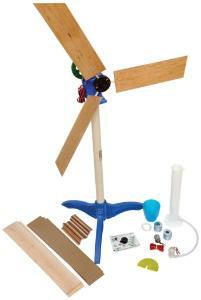 Students can use the blades they design to generate electricity, lift weights, and pump water. This kit is perfect for grades 7–12 and college.